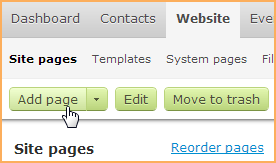 From the Site pages screen, you can add, customize, and delete pages appearing on your Wild Apricot website. For each page, you can control various page settings, including page name, URL, access permissions, meta-tags, and whether the page appears in your site menu. To access the Site pages screen, click Site pages under the Website menu. You can add up to 1,500 site pages. You can group site pages under one another to form multi-level menus. New trial accounts come with a few sample pages to help you get started. You can modify these pages or delete them as needed. 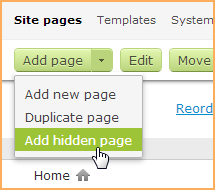 You can create a completely new page or duplicate an existing page. When you add a new page, you can select the template whose content and layout the new page will inherit. 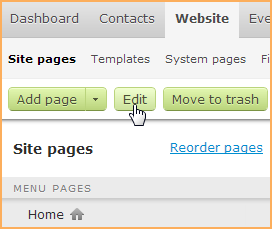 You can also control various page settings, including whether and where the page appears in your site menu. 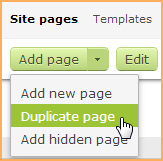 When you duplicate an existing page, you can modify the duplicate page without affecting the existing page. From the Site pages screen, click the Add page button. Review and modify the page settings along the left side of the screen. The new page will inherit the layout and content of the page template you choose. By default, the new page will be positioned after the currently selected page within the site menu. Add layouts to divide your page into sections. Add gadgets to display your content. The web page will now appear on your site – unless you have chosen to hide it – subject to any access restrictions you have set. To add a new page that is set to be excluded from your site menu, click the drop-down arrow beside the Add page button and select the Add hidden page option. 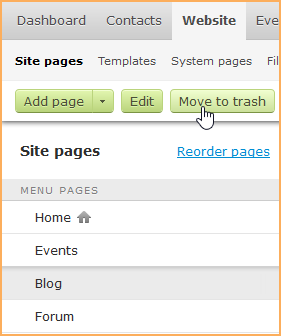 You can exclude any page from your site menu by changing the Position in menu setting to Not in menu. Within the site page list on the left side of the Site pages screen, click the existing page that you want to duplicate. Click the drop-down arrow beside the Add page button and select the Duplicate page option. Alternatively, you could hover over the page you want to duplicate then hover over its info icon and click the Duplicate option. In either case, the new duplicate page will now appear below the existing page within the page list. You can now modify it as you choose. For instructions on modifying site pages, see below. Within the site page list, click the page that you want to edit. If the page you want to select is grouped under another page, you may have to click the plus sign beside the parent page to display its subpages. You can now add, remove, and modify the gadgets appearing on the page. Gadgets can be placed into, above, or below layouts. For content gadgets, you can directly modify the content – including its HTML code – using the content editor. For all gadgets, you can control aspects of its appearance and behavior by adjusting the gadget settings, or other related settings. 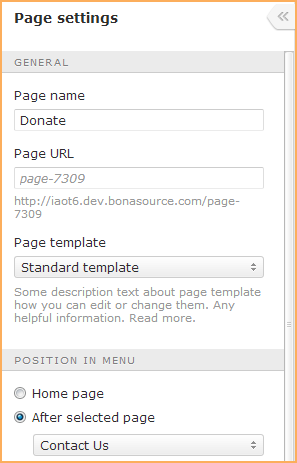 For each page, you can also adjust the page settings, including the page templateused as the foundation for the page. When you are finished modifying the page and its contents, click Save to save your changes. Alternatively, you could hover over the page you want to modify then hover over its info icon and click the Edit option. Within the site page list, click the page that you want to delete. Click the Move to trash button. From the trash, you can view the deleted page, and restore it or empty the trash. You can restore deleted pages and templates and previous versions of pages and templates. For more information, see Restoring page and page templates.